You can use a SAS/STAT predictive modeling procedure to extract surface trends from your original data. If your goal is spatial prediction, you can continue processing the detrended data for the prediction tasks, and at the end you can reinstate the trend at the prediction locations to report your analysis results. Among other output, PROC GLM produces estimates for the parameters in the preceding trend model. Output 98.2.4 shows the table with the parameter estimates. In this table, the coefficient corresponds to the intercept estimate, and the rest of the coefficients correspond to their matching variables; for example, the estimate in the line of "East*East" refers to in the preceding model. For more information about the syntax and the PROC GLM output, see Chapter 41, The GLM Procedure. The requested observations plot is shown in Output 98.2.5. Before you proceed with the empirical semivariogram computation and model fitting, examine your data for anisotropy. This investigation is necessary to portray the spatial structure of your SRF accurately. If anisotropy exists, it manifests itself as different ranges or sills or both for the empirical semivariograms in different directions. You want detail in your analysis, so you ask for the empirical semivariance in 12 directions by specifying NDIRECTIONS=12. Based on the NDIRECTIONS= option, empirical semivariograms are produced in increments of the base angle . You also choose ANGLETOLERANCE=22.5 and BANDWIDTH=20. A different choice of values produces different empirical semivariograms, because these options can regulate the number of pairs that are included in a class. Avoid assigning values that are too small to these parameters so that you can allow for an adequate number of point pairs per class. At the same time, the higher the values of these parameters are, the more data pairs that come from closely neighboring directions are included in each lag. Therefore, values for the ANGLETOLERANCE= and BANDWIDTH= options that are too high pose a risk of losing information along the particular direction. The side effect occurs because you incorporate data pairs from a broader spectrum of angles; thus, you potentially amplify weaker anisotropy or weaken stronger anisotropy, as noted in the section Angle Classification. You can experiment with different ANGLETOLERANCE= and BANDWIDTH= values to reach this balance with your data, if necessary. With the following statements you ask to display only the SEMIVAR plots in the specified number of directions. Multiple empirical semivariograms are placed by default in panels, as Output 98.2.6 shows. If you want an individual plot for each angle, then you need to further specify the plot option SEMIVAR(UNPACK). The panels in Output 98.2.6 suggest that in some of the directions, such as for , the directional plots tend to exhibit a somewhat noisy structure. This behavior can be due to the pairs distribution across the particular direction. Specifically, based on the LAGDISTANCE= choice there might be insufficient pairs present in a class. Also, depending on the ANGLETOLERANCE= and BANDWIDTH= values, too many pairs might be considered from neighboring angles that potentially follow a modified structure. These are factors that can increase the variability in the semivariance estimate. A different explanation might lie in the existence of outliers in the data set; this aspect is further explored in A Box Plot of the Square Root Difference Cloud. This behavior is relatively mild here and should not obstruct your goal to study anisotropy in your data. You can also perform individual computations in any direction. By doing so, you can fine-tune the computation parameters and attempt to obtain smoother estimates of the sample semivariance. 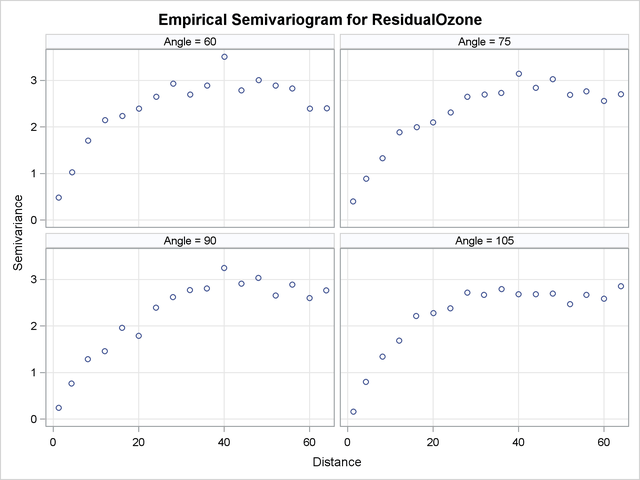 Further in this study, the directional plots in Output 98.2.6 suggest that during shifting from to , the empirical semivariogram range increases. Beyond the angle , the range starts decreasing again until the whole circle is traversed at 180 and small range values are encountered around the N–S direction at . The sill seems to remain overall the same. 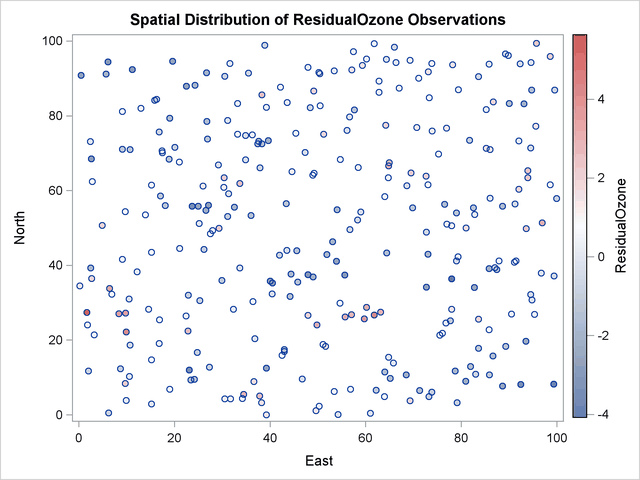 This analysis suggests the presence of anisotropy in the ozone concentrations, with the major axis oriented at about and the minor axis situated perpendicular to the major axis at . The multidirectional analysis requires that for a given LAGDISTANCE= you also specify a MAXLAGS= value. 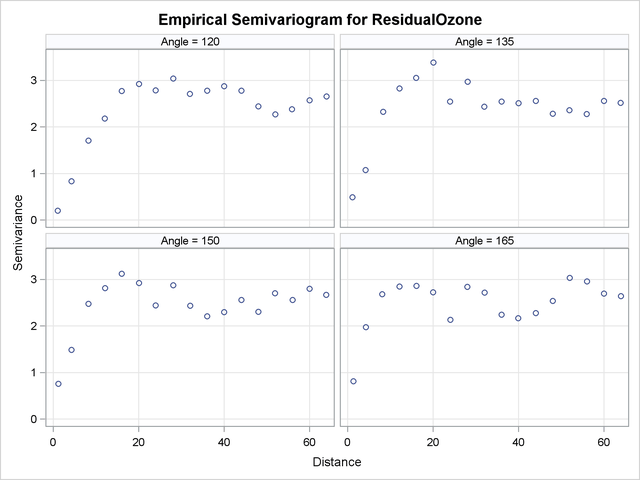 Since the ozone correlation range might be unknown (as assumed here), you can apply the rule of thumb that suggests use of the half-extreme data distance in the direction of interest, as explained in the section Spatial Extent of the Empirical Semivariogram. Following the information displayed in Output 98.2.3, for different directions this distance varies between and km. In turn, the pairwise distances table in Output 98.2.2 indicates that within this range of distances you can specify MAXLAGS= to be between 12 and 17 lags. In this example you specify MAXLAGS=16. For the purpose of the present example, it is reasonable to assume a constant nugget effect equal to zero, based on the empirical semivariograms shown in Output 98.2.6. The same output suggests that the model scale is likely to be above 2, and that the range might be relatively small in . You specify the PARMS statement to set initial values for the exponential model parameters and account for these considerations. The VARIOGRAM procedure repeats the fitting process for each one of the selected directions. First, in the parameter search table in Output 98.2.7 shows you which value combinations are tested initially to choose the one that gives the lowest objective function value. From this search, the combination of scale equal to 2.5 and a range of size 5 is passed as initial values to the model fitting process. This result is reflected in the model information table shown in Output 98.2.8. Fitting is successful, and among the output objects you can see the estimated parameters and the fit summary tables for the direction in Output 98.2.9. A corresponding parameter search takes place for the direction . The respective table and the choice of initial values for fitting in the direction are shown in Output 98.2.10. Output 98.2.11 displays the estimated parameters and the fit summary for the direction . The fitted and empirical semivariograms for the selected directions are displayed in the panel of Output 98.2.12. 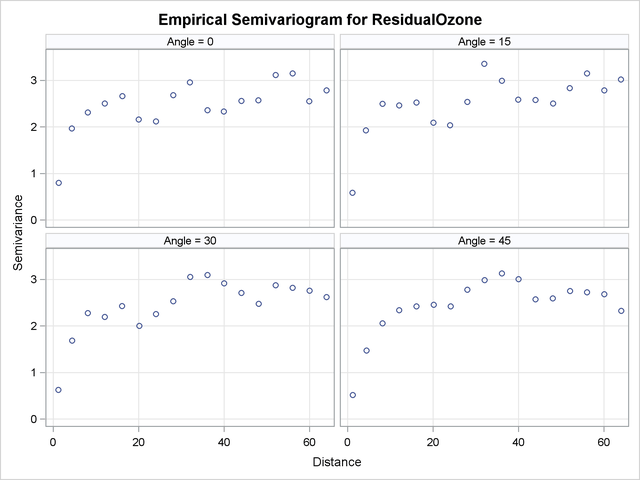 Conclusively, your semivariogram analysis on the detrended ozone data suggests that the ozone SRF exhibits anisotropy in the perpendicular directions of N–S ( ) and E–W ( ). As an alternative, you can use PROC VARIOGRAM to fit an exponential model to all different angles examined in this example, and then select the constant scale value to be the mean of the scales across all directions.